"Hamilton" creator Lin-Manuel Miranda released a new original song Friday to raise money for Puerto Rican hurricane relief and he's enlisted some of the biggest Latin stars in music to help. He's also standing by a tweet saying that President Donald Trump is "going straight to hell" after Trump attacked the mayor of San Juan in the wake of Hurricane Maria and said that Puerto Ricans "want everything to be done for them." "It's unprecedented language for me," Miranda said Friday on "Today." "But it's unprecedented to have the president of the United States attack the victims of a natural disaster. I've never seen that before." "Almost Like Praying" features Jennifer Lopez, Marc Anthony, Camila Cabello, Gloria Estefan, Fat Joe, Luis Fonsi, John Leguizamo and Rita Moreno, among many others. All proceeds from the download and stream go to The Hispanic Federation's disaster relief fund. "I was like every Puerto Rican with ties to the island, with family on the island. We all had a terrible few days of silence. For some, those days were weeks," Miranda told The Associated Press. "For me, that helplessness turned into, 'OK, well what can I write that will help? Can I write a tune that we can monetize?'" Miranda said he made an a cappella demo in a bathroom in Austria — where he was on vacation — and sent it to Atlantic Records, enlisting help. The subsequent recording process took a breath-taking 72 hours and took him to studios in New York City, Los Angeles and Miami to link up with the music stars. "Everyone said yes and then it became the logistics of getting everyone recorded," he said. The song borrows from "Maria," the classic song from Leonard Bernstein and Stephen Sondheim's "West Side Story" and Miranda said the song popped into his head after the hurricane by the same name devastated Puerto Rico on Sept. 20. The song's lyrics list all of the 78 towns of Puerto Rico. Miranda said he didn't want inland and mountainous communities to be ignored as bigger cities get power and food. "This song is designed so that those towns never feel forgotten again," he said. 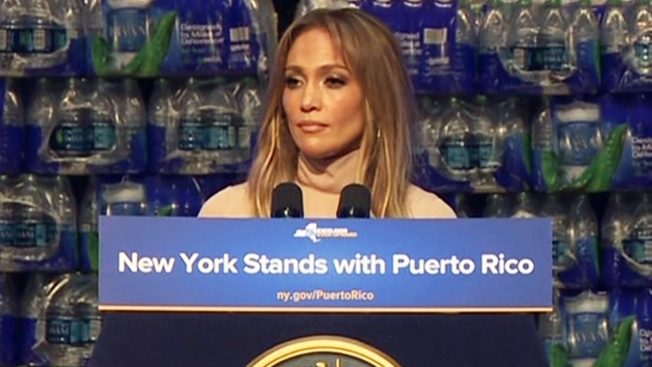 "I cannot wait for Puerto Ricans to hear Luis Fonsi sing the name of their town or J.Lo to sing the name of their town." One verse turned out to be exceedingly hard to get. Miranda reached out to the rapper PJ Sin Suela but never heard back. Sin Suela finally answered on Saturday, saying he was on the island and had just gotten power. He offered to help and Miranda asked if there was a studio nearby where he could record a verse. Sin Suela found one in San Juan and recorded the verse but couldn't get enough bandwidth to email it to Miranda. Estefan, who was flying to Puerto Rico the next day on a relief mission, volunteered to pick it up. On Monday night, while Miranda was working on the song in Miami, Estefan sent him a photo of her holding a memory stick — containing the missing verse. "Everyone cried, we were in tears. We screamed, 'We got this verse out of Puerto Rico!'" said Miranda. "That gives you an example of the effort and the cooperation involved." Also featured on the song are Ruben Blades, Pedro Capo, Dessa, Juan Luis Guerra, Alex Lacamoire, Ednita Nazario, Joell Ortiz, Anthony Ramos, Gina Rodriguez, Gilberto Santa Rosa, Tommy Torres and Ana Villafane. (Ricky Martin and Daddy Yankee were too busy with relief efforts to join in). "Everyone is doing their part. I've never seen such mobilization in my life," Miranda said. The Tony, Emmy and Grammy-winning Miranda has long used his megaphone for social causes, including asking Congress to help dig Puerto Rico out of its debt crisis, performing at a fundraiser for Hillary Clinton on Broadway, lobbying to stop gun violence in America and teaming up with Jennifer Lopez on the benefit single "Love Make the World Go Round." Miranda has been critical of President Trump's response to Maria but had nothing but praise for the ordinary Americans who have sent diapers, baby formula, batteries and money and other aid to the island. Many communities there are still waiting for power and clean water. Miranda lashed out at Trump on Twitter Saturday after Trump suggested Puerto Ricans "want everything to be done for them" and accused San Juan Mayor Carmen Yulin Cruz of being "nasty" over her criticism of the federal recovery efforts. "You're going straight to hell, @realDonaldTrump. No long lines for you," Miranda tweeted to the president. Miranda clarified his tweet to The New York Times in an interview this week, saying: "That’s not how I talk. This is not an everyday occurrence. Then again, I’ve never seen a sitting president attack the victims of a natural disaster." He added, "I’m not that guy. But it was the only thing I could think to say in the face of an attack on a people already besieged." "This was an unprecedented disaster and requires an unprecedented federal response. They have not yet gotten an unprecedented federal response," Miranda said. "I am longing and waiting and jumping up and down for a federal response to match the response of our people." Miranda reiterated those points in the interview with "Today." He said he does his best "to be the silver lining in the world because the world is how it is," and that his tweet was not "impulsive." "Those were the only words I had left," he said. "And I'm a guy who puts words together for a living. They're all I have available to me to express my reaction to his attack on the people of Puerto Rico."